Introducing $2 Tuesdays! 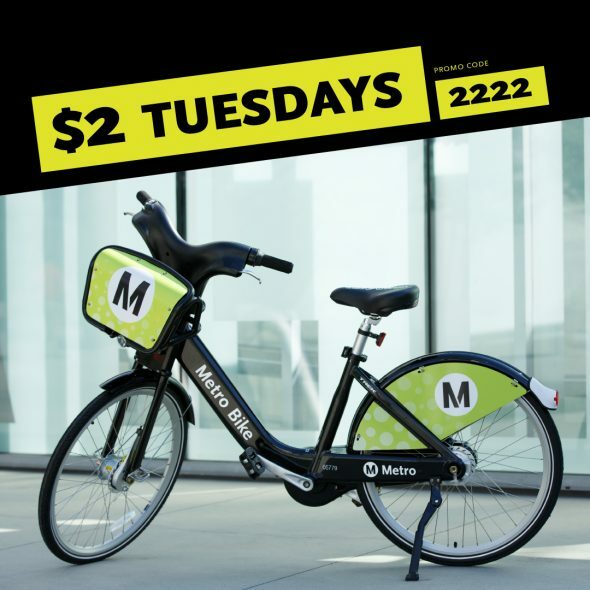 Walk-up users can enjoy a discounted 30-minute Metro Bike ride on Tuesdays with the promo code 2222. Each 30-minute (or less) ride will be $2 and you can use the code for as many $2 rides as you want throughout the day. Please note that if your ride goes past 30 minutes, you will be charged the regular rate of $3.50 per 30 minutes thereafter. Of course, if you find yourself riding Metro Bike more than once a week (and not just on Tuesdays), you might want to consider purchasing a monthly pass. A monthly pass is $20 and gives you unlimited 30-minute rides for the whole month.